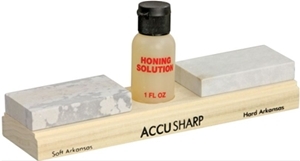 Combination Knife Sharpening Kit. Includes fine and medium grit natural whetstones each measuring 3" x 1 5/8", and 1 oz. bottle of honing oil. Wooden base holds all items. Boxed with hanging tab.